The Alphabet Network is sticking with Steve. 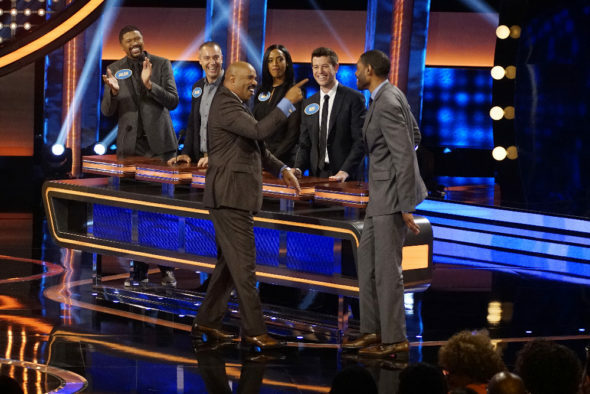 The Celebrity Family Feud TV show has been renewed for a third season on ABC. Hosted by Steve Harvey (who also hosts the syndicated Family Feud game show), Celebrity Family Feud is executive produced by Thom Beers, Gaby Johnston, and Jennifer Mullin. ABC Entertainment President Channing Dungey broke the news that ABC had picked up season three of the game show at the beginning of today’s TCA executive presentation, according to Deadline. Updated 3:30pm ET: press release added. Survey says ABC is pleased as punch with its slate of summer game shows. Dungey also announced the $100,000 Pyramid, To Tell the Truth, and Match Game TV shows have each been renewed for a second season. What do you think? Are you a fan of the Celebrity Family Feud TV series? Do you plan to watch the third season on ABC? It’s great to see the hilarious Celebrity Family Feud will be back for a third season! Steve Harvey is so good in every way at what he does on hysterically funny show! CelebFamFeud definitely has to be the best and favorite show of the summer! Lookin’ forward in watching what Ole Steve Harvey and the Celebrity families have in store for us this season! Me and my boyfriend would love to watch another season of celebrity family feud.